On Aug 27 2015, we conducted one more webinar as part of Telerik India. This time we talked about how to “Consume Azure Mobile Services in Telerik Platform“. This blog post is a recap of the webinar. You will find the video recording of the webinar in this blog post. Telerik Platform is a modular platform for web, hybrid and native development that integrates a rich set of UI tools with powerful cloud services. This end-to-end development and project management solution provides tools and services for every stage of your application lifecycle – from idea to deployment and on-device performance. You can know more about Telerik platform here. There is no slide deck for this webinar. I did not use any slide deck and did most of the things hands on. On July 30th, we conducted one more webinar. This time it was about our new Enterprise Capabilities you get with our Telerik Platform. This blog post is a recap of the webinar. If you are new to Telerik Platform, do check out www.telerik.com/platform for more information on what is Telerik Platform and what you get with Telerik Platform. We accelerate each step of your mobile app development journey with our Platform. Telerik Platform is a set of Cloud Services that help you with your app prototyping, app building, mobile backend, app analytics, app testing, app management and app feedback. Do check out the product page for more information. Q: In ScreenBuilder, can we use our own images for the icons? A: Not in the screen builder. But once screen builder has created the screen, the app can be opened in AppBuilder and code can be customized or tweaked according to your needs. Screen Builder gives you a jump start with scaffolding the screen. Q: How much can we configure the item template in Data List view? A: You can create your own custom template for the list view items in AppBuilder. The Screen Builder just creates a basic scaffolding of the list view and its items. You can then take over and customize the code in AppBuilder. Q: For the connection between Telerik mBaaS and Data Link Server, is it via a certain port number only? A: Nope. Telerik mBaaS needs a IP or domain which can be pinged from Internet. In the demo we ran our Data Link Server on a port # and exposed that to outside world. Q: How testing is done in Telerik Platform? Q: Can i use your platform to build the complete app with database support on your platform itself? A: Yes, you can. In this scenario you will be utilizing our Backend Service for database & AppBuilder Service which is nothing but a IDE for developing Hybrid Mobile App. Q: Can we connect this with Line of Business applications like SharePoint, CRM , SAP? A: Yes you can. At the moment you will need to work with the REST API that the business applications provide. Sonn, over the course of the time, we will be adding Data Connector capability out of the box to many enterprise stores. Stay tuned. Q: Is there a restriction in programming language used during mobileapp development? A: Yes, we use HTML 5, JS and CSS for development of mobile apps – hybrid or native. Q: Can we do it using visual studio or some kind of IDE? Hope this webinar was helpful to you and gave you an idea as to how fast you can become mobile with our Telerik Platform. We will be excited to know what you guys are building as part of your enterprise. Do get in touch with us for any information you may need on Telerik Platform. On Oct 16 2014, we conducted a webinar titled “Solving Enterprise Mobility Considerations with Telerik Mobile Platform”. This is a recap blog post of the webinar. In this blog post you will find the slide deck, video recording and questions & answers from the webinar. Telerik Platform is a modular platform for web, hybrid, and native development that integrates a rich set of UI tools with powerful cloud services. This end-to-end development and project management solution provides tools and services for every stage of your application lifecycle – from idea to deployment and on-device performance. Telerik Platform integrates AppPrototyper, AppBuilder, Backend Services, Analytics, Mobile Testing, AppManager, and AppFeedback to help you solve the challenges of designing, building, connecting, testing, deploying, managing, publishing, and measuring your applications. You can know more about Telerik Mobile Platform here. Here are the 2 lucky persons from the webinar who have been selected to receive our .NET Ninja T-Shirt. Congratulations to the winners. We will contact you shortly and ship the t-shirt. Rest of you dont worry, we still have a lot of webinars coming up. So make sure you attend our future webinars too. On Jun 19 we conducted a webinar titled “Build Hybrid Mobile Applications for Nokia Lumia Devices”. This was part of our monthly webinar we do for APAC region. This blog post is a recap of the webinar and you will find the slide deck used in the webinar, video recording of the webinar, Q & A section and of course the t-shirt winners details. So read on. Q: What is difference between mobile app and hybrid app? Q: Can mobile web apps run without net connection also what about hybrid apps? A: Mobile Web Apps are served from a server. So if there is no internet connection on the device, you can connect to your mobile web app. Where as a Hybrid App gets installed on the device. So you can pretty much handle the scenario of no connection and show a user friendly message. Q: What is the basic Diff. B/w cordova (Phonegap) and Telerik Hybrid Mobile Developement? A: Telerik Hybrid Mobile Apps use Kendo UI Mobile which can adapt to the platform they are running on and provide you a native look and feel for your app. 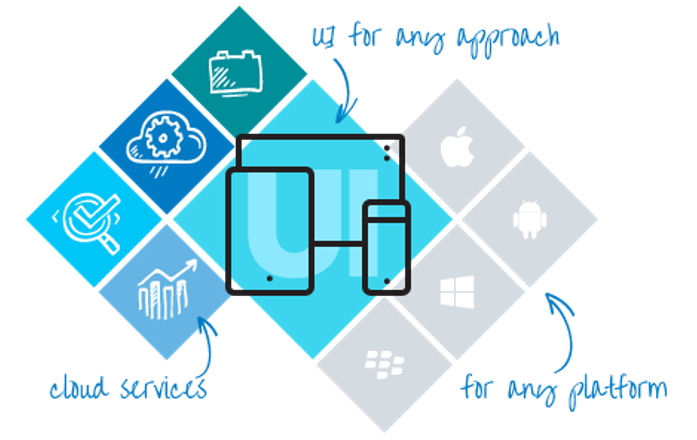 Where as when you develop an app with Cordova, you will be using UI control sets like Jquery Mobile UI. Q: Is Cordova a standard API across all hybrid applications OR do other equivalent APi’s exist? A: With respect to Hybrid Mobile Apps, Cordova is the only JS API which can provide you with the device capabilities. Q: How many platforms can we target? Q: How much effort is required to repackage for diff platforms? A: Using AppBuilder, you can package for iOS, Android and Windows Phone with one Button click. Q: Are these controls free of cost? Q: Can we develop for BlackBerry using Kendo UI ? A: Yes you can. Kendo UI Mobile controls support Black Berry platform. Q: Is AppBuilder only for creating hybrid apps and that too using Telerik? Q: Does AppBuider work with VS 2012 as well? Q: Can we add other plugins to this Kendo UI Mobile App? Q: Does we have manifest file to put icons and dev information? A: AppBuilder provides a project property feature where all meta data can be entered and during packaging it will convert it into a manifest. Q: Where can i check other demos or source codes for mobile? A: We have a whole list of Hybrid Mobile Application samples and can be found here. Congratulations to the winners. Those of you who did not win, dont worry. We have a lot of webinars lined up for the year. So keep coming back and try your luck.